Chicken worth crossing the road for. At Big J’s, the search for perfect fried chicken is over. Our chicken is brined overnight and soaked in buttermilk so it stays super juicy inside while we dredge it in our special blend of batter and spices and fry it to crispy perfection on the outside. 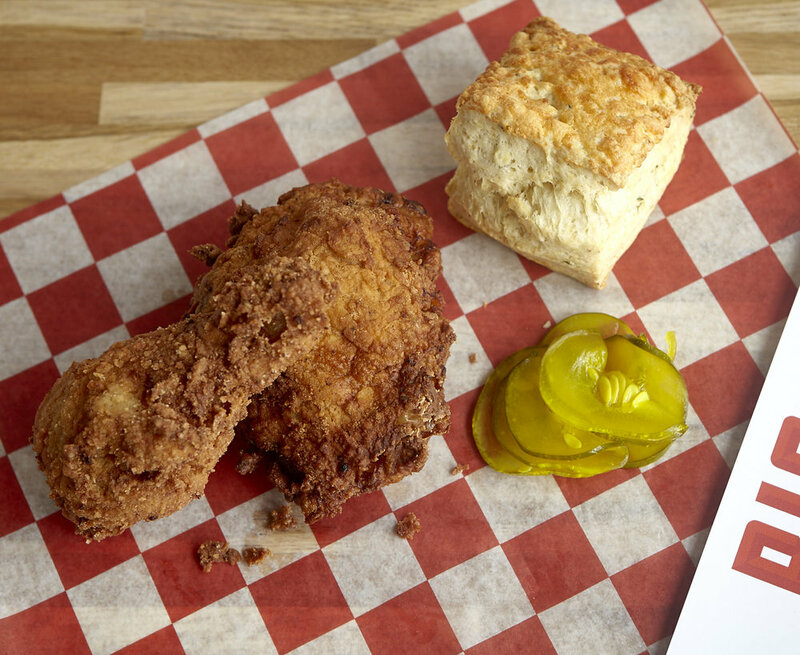 If you’ve got a mouth of steel, try our Nashville Hot chicken, served with a rubber glove and fair warning! If you’ve got more of a Northern palate, try our Portland Hot—just spicy enough, without the pain. Or go classic with the crispy, breaded Traditional style. Whether you like it spicy, crispy or saucy, every leg, thigh and breast we serve is fresh, hot, and delicious, and our salads and sides are homemade in our kitchen. This is no corporate chicken! Feel free to enjoy beverages from our neighbors Bissell Brothers Brewing, Cellardoor Winery, and Stroudwater Distillery. *Menu subject to change. Prices do not include tax. It takes a little longer to make a piece of chicken this special, but we believe it’s worth the wait. While you wait, quench your thirst with one of Bissell Brothers Brewing’s tasters. Eat and drink in our dining room or their tap room.